Working with Absorption Trenches and cleaning septic systems, helping people solve their Absorption Trench problems is a regular occurrence for me. 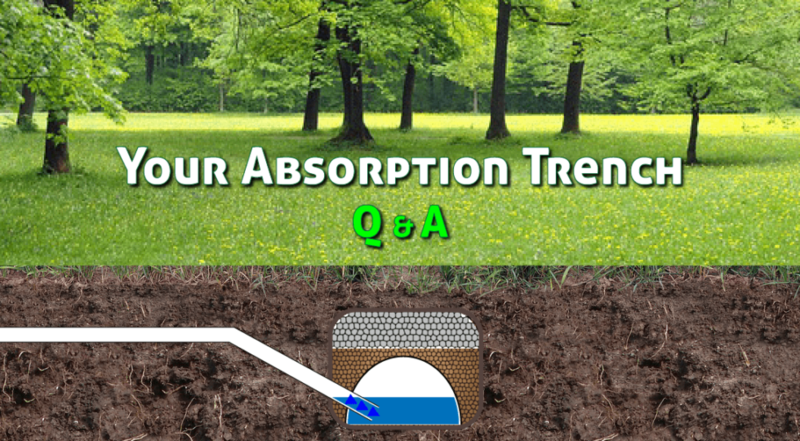 I am asked lots of questions about Absorption Trenches and have tried to answer some of the more popular questions I get asked here for you. Anyway, the information here is to explain in regular terms the answers to questions you may have about your septic system and the very important Absorption Trench component that helps to make it all work. And with the proper care, you will hardly have to think about it for up to 5 years at a time, so long as things are set up right from the word GO. 1: Why are Absorption Trenches important? A. 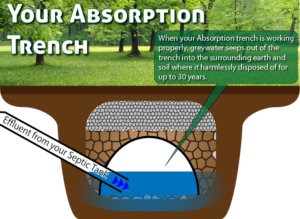 Your Absorption Trench is an extremely important part of your Septic System. The absorption trench is where all the effluent processed in your septic tank system is put back into the environment in a clean and safe way. An absorption trench is an environmentally sustainable system that if created properly can last for up to 30 years or more without the need for human intervention at all. This doesn’t mean your septic system can go for this amount of time without a clean. Solid wastes must be cleaned out (septic tank pumping) about every 5 years to keep them healthy. This is important. A septic system left too long between cleanouts can start to send solid material down the line to your absorption trench and block the trenches ability to effectively dispose of effluent (liquid septic waste) into the surrounding soil. This is where the harmful bacteria is neutralised by soil, plants and the sun. The remaining effluent becomes a valuable nutrient for the surrounding soil. When your absorption trench does start to get blocked with solid waste from your septic tank, you start to get unpleasant smells around the absorption trench “drain field” where your trench is located. This will eventually lead to the ground getting soft and soggy and in the worst case allow untreated effluent to sit on top of the absorption trench field where it can become a major health hazard. This, if left unchecked, will lead to the ground around your absorption trench getting soft and soggy. In the worst case allowing untreated effluent to sit on top of the absorption trench field (above ground) where it can become a major health hazard. This can also leave your old absorption trench useless and in need of replacement. 2: How Big Does My Absorption Trench Need to be? A. There are many factors that influence the size an absorption trench needs to be to be effective. The short answer is the more load you place on your trench and septic system, the larger it has to be. Factors like the number of people living in your home, the type of soil that your trench is located in, the contour of the land ( and how well it drains), how large a plot of land your drain field is located in and the type of foliage that surrounds it (large tree, shrubs etc.). 3: How Do I Know if My Absorption Trench Needs to be Replaced? A. The short answer is, you will know that your absorption trench needs help when the ground around your trench, the “Drain Field” is wet, soggy and smelly. This is most often the result of solid material (sludge) from your septic system flowing out with the effluent (the treated liquid waste from your septic system – greywater) into your absorption trench. Your absorption trench is designed to let the liquid effluent pass through the trench into the surrounding soil through small holes in the pipes that make up your drain field system. The solid material that overflows into your drain field (absorption trench) when your septic tank is too full and needs servicing acts to clog the holes and prevents the effluent from correctly dissipating. This will eventually destroy the effectiveness of your absorption trench and require complete replacement. A costly exercise.